We are major supplier of breathalyzers to the UK and offer quality, impartial advice. Breathalyzers ranging from budget to Police spec. Buy Today ! We supply general public, Police forces and a large number of UK companies with top of the range breathalyzers and are leaders in our field. 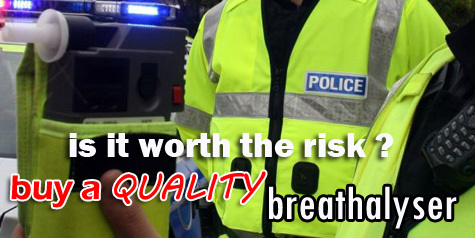 If you are looking for free, expert breathalyzer advice then give us a call or drop us an e mail. We will be happy to help. Supplying breathalyzers to NHS trusts, Schools, Universities, Industry, Offshore Oil Industry, Road Haulage Contractors, Train Companies, Airline Pilots. There has been a huge increase in the number of random breathalyzer tests carried out by Police. This can be roadside testing or in many cases following an accident. Why take the risk ? It is now possible to buy a quality breathalyzer that will give the same accuracy as the Police issue units. If you wish, we can even supply you with the EXACT same model that is used by Police in your area. Thsi will normally be a Lion 500 or Draeger 5510 or Draeger 6820. Buy from us and rest assured of buying quality and reliability, backed up by a 12 Month warranty and our expert post sales advice line if required for all your breathalyzer needs. We can supply in bulk or to individuals. Contact us for advice and a quote on your chosen breathalyzer.